Can you imagine riding a cheetah? Besides the fact that it would probably hate you being there, it would also be pretty incredible. Just watch this video simulating what that would be like. 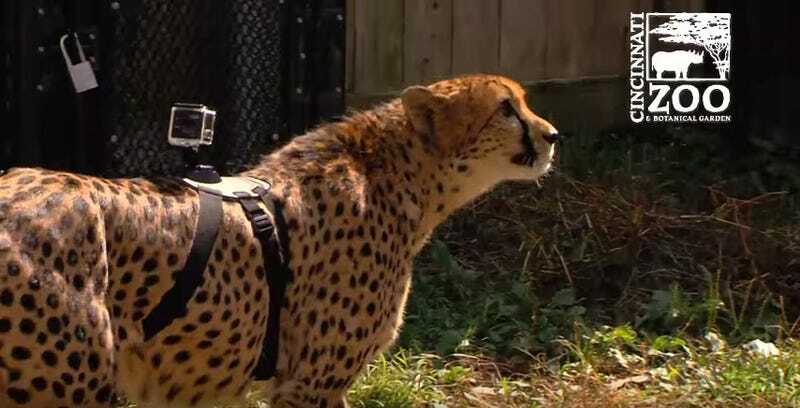 Cincinnati Zoo & Botanical Garden officials outfitted one of their cheetahs, Savannah, with a GoPro camera to capture what a cheetah in full run looks like. Zoo officials said putting the harness on Savannah was easier than you would expect, since all the cheetahs are hand-raised from a young age. “We put it on Savannah and she could really care less,” said Alicia Sampson of the cat ambassador program at the zoo. The video shows Savannah running at full speed and in slow motion. The unedited footage is erratic and incredibly shaky, but the slowed-down video shows how the cheetah’s head stays generally still while running, even if the rest of the body is jerking around.